What are you doing to survive this terrible, no-good, very bad winter? Are you escaping to a warm island (take me with you!) and enjoying the beach? Hunkering down with blankets, a puppy and a Netflix marathon? Or maybe attending hot yoga and dreaming of warm islands and beaches? We’re doing all of the above. And we’re also making this. 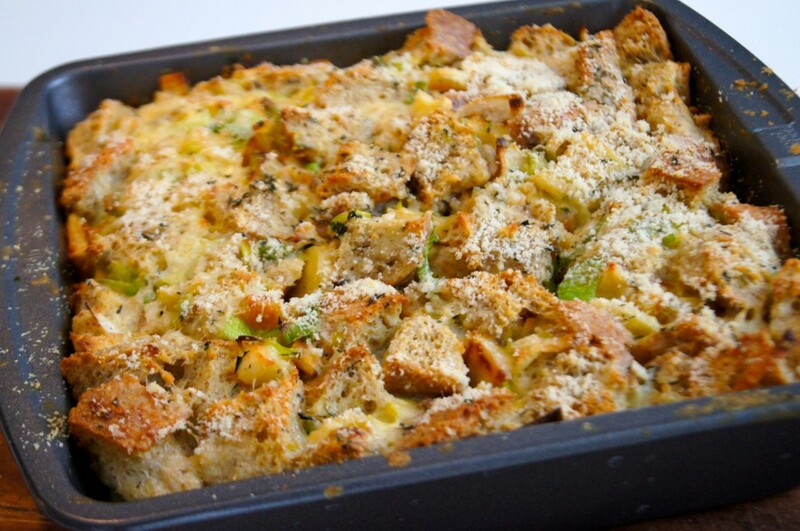 This savory bread pudding blends winter comfort food and spring flavors together seamlessly. The mild onion flavor of the leeks is light enough to not overpower the roasted parsnips. 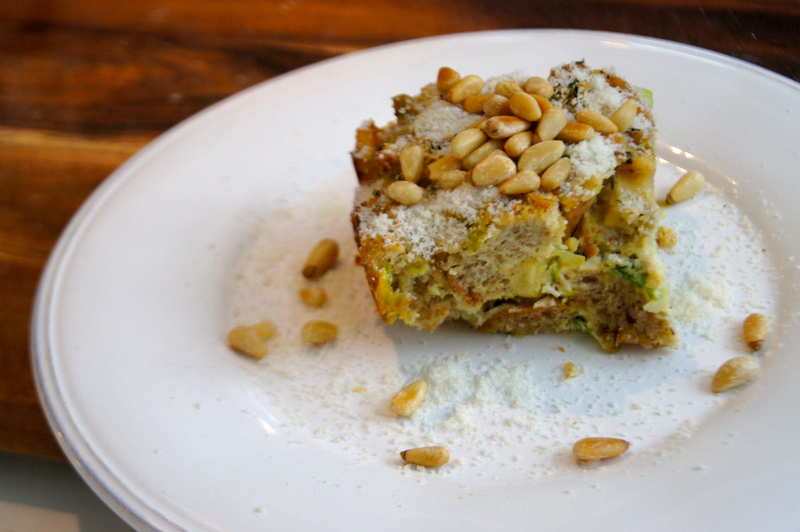 And the Parmesan and pine nuts stand up nicely to the heartiness of the whole grain bread. While I do love the flavor of this dish, I am more excited by how healthy it is. Bread puddings, both savory and sweet, have a bad reputation for being laden with dairy, eggs and refined carbs. We’ve replaced the traditional custard with a blend of eggs, egg whites and silken tofu (gasp!). The tofu might seem strange, but it helps to give the bread pudding its structure and creaminess. Combining this made-over custard with whole grains and veggies allows you to enjoy bread pudding whenever you like! Until recently, parsnips were pretty low on my list of favorite vegetables. I neither loved them nor hated them and their white color had me thinking that they were somehow less healthy than carrots, greens and the like. 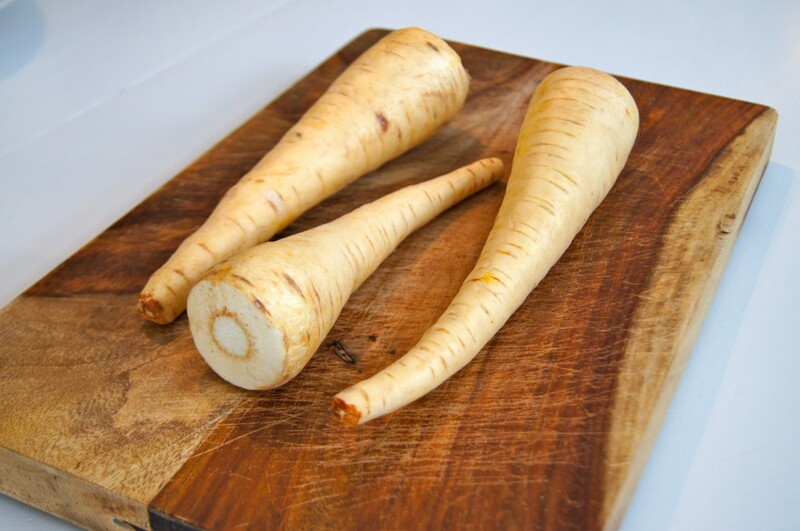 However, parsnips are high in folate, potassium and vitamin C, making them worthy of some culinary attention! They are also really fun to purée, mash and roast. My younger sister whipped out a parsnip purée that replaced her white sauce for a vegan green bean casserole last year at Thanksgiving. So yeah, parsnips are pretty awesome. ½ whole-wheat baguette (or one demi-baguette), preferably a little stale. 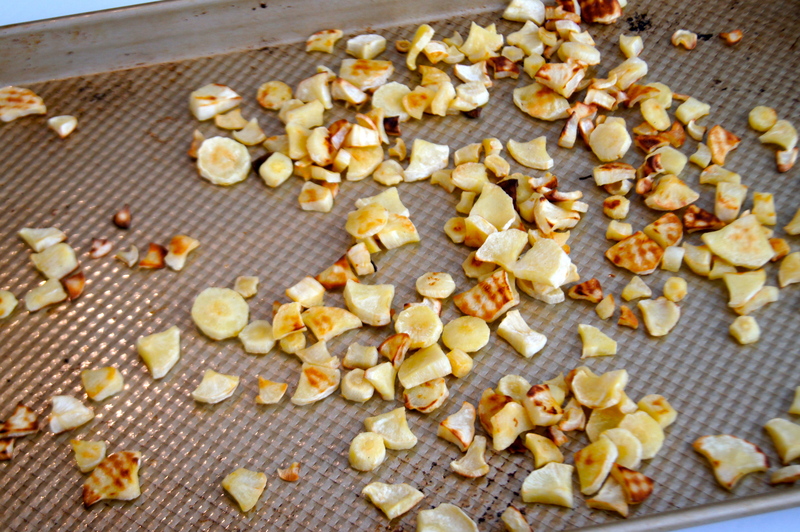 peel parsnips and chop into ¼ inch pieces. toss parsnips in 1 T olive oil and ¼ tsp. salt, and spread on a sheet pan in a single layer. bake until parsnips are lightly browned and fork tender, about 8-10 minutes. stir the parsnips after about 5 minutes of cooking to ensure even browning. when parsnips are removed, lower the oven to 350 degrees F.
making sure that the leeks are thoroughly washed, remove the dark green tops and slice lengthwise. 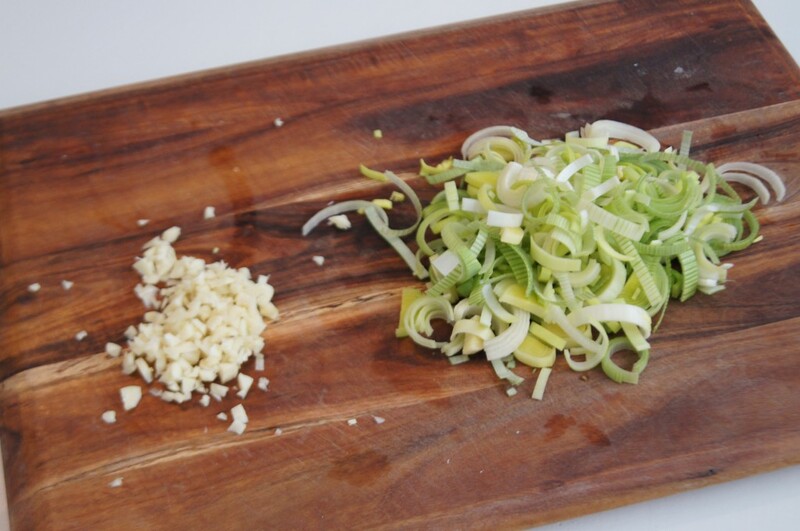 slice leeks thinly. peel and mince garlic. in a small sauté pan, heat 1T of olive oil over medium heat. add leeks and cook for two minutes, stirring often. add minced garlic and cook for an additional two minutes, or until fragrant. season with ¼ tsp. salt and stir. remove garlic and leeks from pan and set aside to cool. 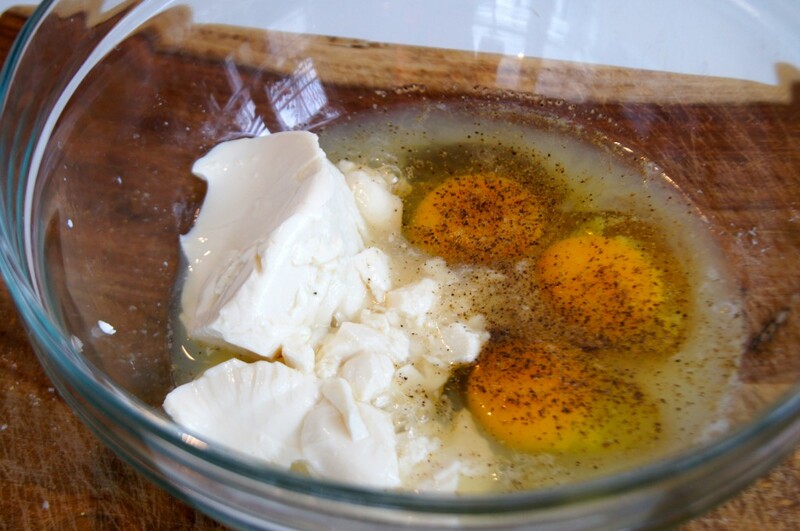 in a large mixing bowl, combine eggs, egg whites, tofu, ½ tsp. salt and black pepper. using an immersion blender, blend until mixture is smooth and no lumps remain. 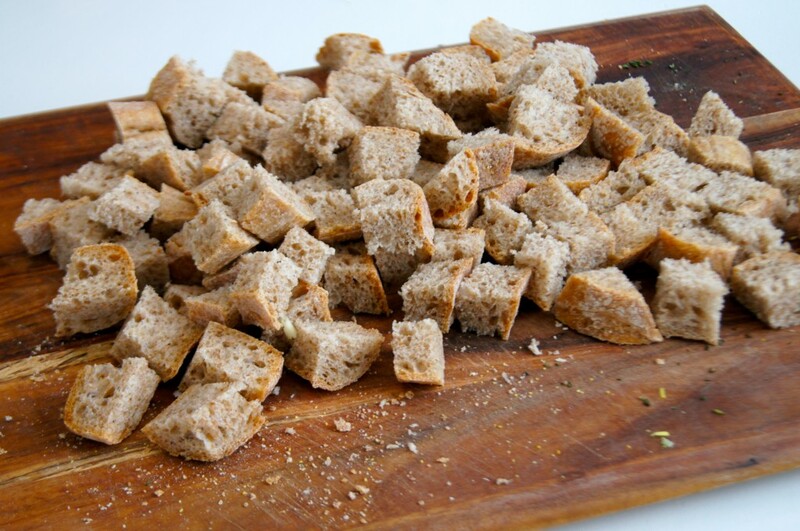 cube the bread into 1/2 inch cubes and toss in the egg mixture, being sure that all of the bread is completely soaked. add 1 tsp. of chopped thyme, the cooked parsnips, and the leek mixture to the bread and egg mixture and stir. if the bread does not immediately soak up all of the egg mixture, let it sit for up to 20 minutes, stirring occasionally. when the bread has soaked up all of the liquid, transfer to an 8×8 baking dish that has been lightly greased. press the bread down lightly, and sprinkle the top with parmesan and remaining thyme. bake at 350 degrees F for 30-35 minutes, or until the middle is firm and set, and the top is lightly browned. 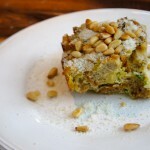 serve with extra parmesan and toasted pine nuts!